Mohalatsi Mabilietse is a Central University of Technology, Free State (CUT) student who has a very small stature. For years, the 2nd year IT student depended on his sister and friends to drive him around. He was born and bred in Philindaba, Bloemfontein and matriculated from Martie du Plessis in 2013. With a height of 4.6 feet, modern life became a burden to him, as driving a normal car was a challenging exercise. His legs were so short that he could not reach the pedals. 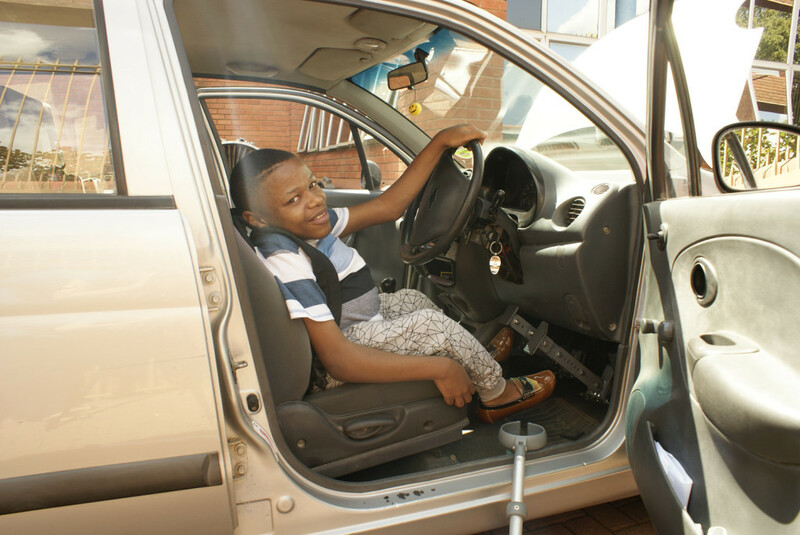 Mohalatsi represents many students with disability in higher education institutions who through various circumstances have been disadvantaged from driving a normal car. Many of them are at risk of causing fatal accidents if they continue to drive cars unaided. He never knew where to find help. Desperate to improve and change his day-to-day ordeal, he approached Product Development Technology Station (PDTS), a technology innovation agency at CUT, with an idea of extended pedals and explained it to Kamohelo Mokoena, Mechanical Engineering graduate from CUT who advised him to draw up a proposal and submit it to PDTS for consideration. “This great idea was inspired by the student himself. He approached and explained his idea to us and kindly asked if we could manufacture the pedal extension for him, which was a great, but challenging experience”, said Mr Ludrick Barnard who heads a team of young and innovative minds and experts. “We took the idea, did research, and came up with the concepts and design. I mentored my intern on what and how it should be done and we got it right,” he concluded. He and Mokoena started modelling the idea and came up with a perfect product that liberated the student. With the help of PDTS, Mabilietse is able to drive himself anywhere without hassle. Today, he drives himself around the streets of Bloemfontein and from home to campus. “I am pleased and grateful for the wonderful work that PDTS has done for me. It has helped me a lot. I do not depend on people to take me from A to Z now. I am independent and enjoying every moment,” said Mabilietse. Thanks to PDTS, CUT is emerging as a leader in creating niche products and solutions that are almost impossible using conventional techniques. It offers a one-stop solution for product and industrial designers to manufacture prototypes. The idea of these extended pedals is the first of its kind in the country and can make CUT stand proud at the forefront of innovation for the country’s motor industry. “We used six millimetres of normal steel plate (which a person can use if he wants to go into mass market), carbon fibre, canopy clips, and rubber. The total cost for the material was between R500 and R700,” said Mokoena. Mabilietse is a humble person who loves outdoor, adventure, sports, and hanging out with his family and friends. In the drivers seat with his extended driving pedals, is Mohalatsi Mabilietse. 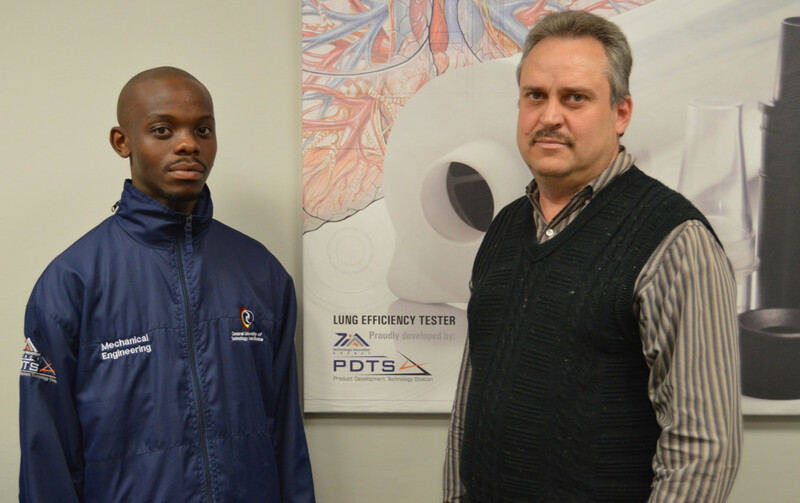 PDTS Director, Mr Ludrick Barnard, and Mr Kamohelo Mokoena, a mechanical engineering graduate from CUT are the brains behind the innovation. 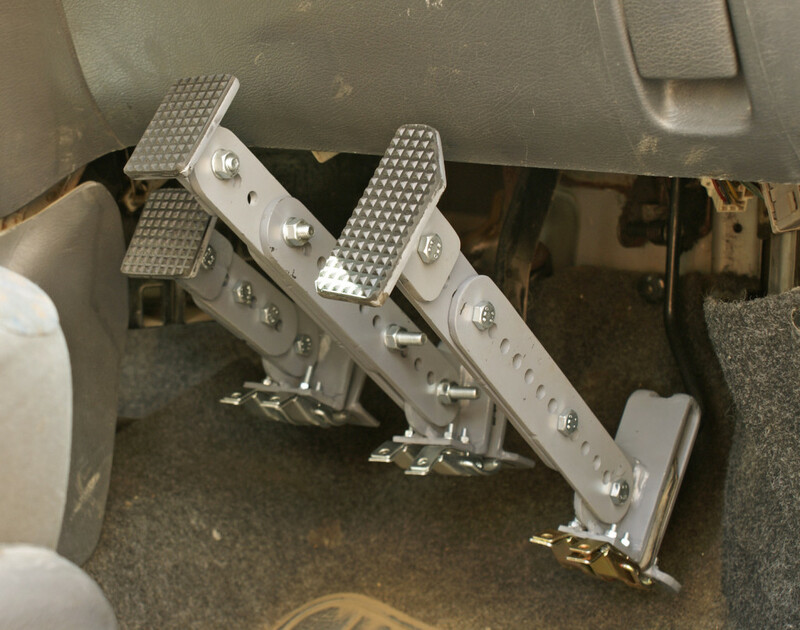 Pedal extensions were designed to give leverage to the student who could not fully reach the pedals in a normal car. Today, Mohalatsi can drive himself around the streets of Bloemfontein, home and take himself to campus.